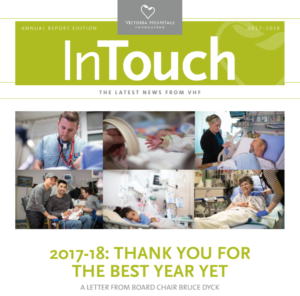 Every summer, we publish an annual report edition of our In Touch newsletter, highlighting contributions to our hospitals and reporting back to our donors and the community at large about our fundraising activities and expenses. The Annual Report is created as a transparent tool to inform our stakeholders about our activities throughout the year and the details of our finances, but it also acts as a key accountability piece. 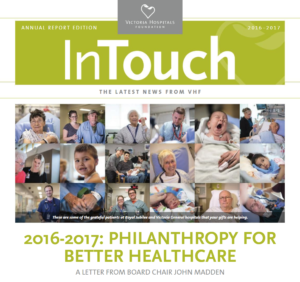 Through carefully crafted content, it demonstrates the value of the work we do while highlighting the crucial role fundraising plays in the delivery of healthcare in our region. 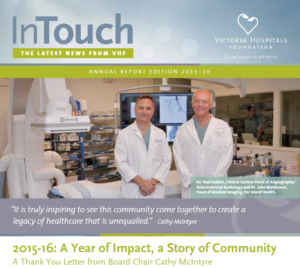 See our past Annual Reports below.